Worcester Warriors winger Sam Smith ran in four of his side's six tries as they returned to the top of the Championship table with a bonus-point win against Yorkshire Carnegie at Headingley. The Warriors' eighth bonus-point win in 10 games puts them three points clear of Bristol, who play Plymouth Albion on Sunday afternoon. Flanker Mat Gilbert and full-back Chris Pennell also crossed for the visitors. 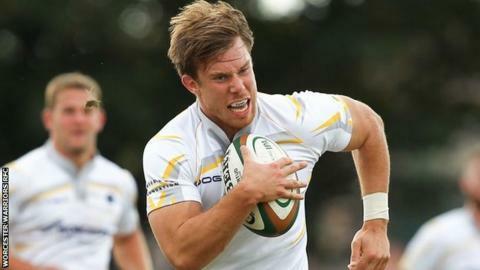 But former Harlequins flier Smith stole the show with four second-half tries. Worcester are now without a game for a fortnight until they host Cornish Pirates at Sixways on 10 January (15:00 GMT). Three of those tries came in the final 10 minutes as the Warriors, who trailed 14-12 at half-time and were still being held 17-17 going into the closing stages, at last cashed in against tiring opposition. Ryan Lamb was successful with just one conversion attempt, while his late replacement Ignacio Mieres kicked two. Home stand-off Harry Leonard kicked four penalties, bur failed with his conversion attempt at centre Rob Vickerman's first-half try.